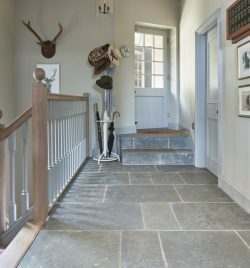 There’s no denying the impact that gorgeous grey has on any interior, and there is a whole world of choice when it comes to using grey stone on your floor. The plethora of materials, textures and finishes that are available in this versatile colour – from the paler shades to the darker, stormier hues – will delight and complement any scheme whatever your design ideas. The reason for grey’s enduring popularity is definitely down to its versatility. A grey stone tiled floor with be enlivened by crisp white, it will look stylish and sophisticated with muted shades of colour such as pale greens, it will be softened and warmed by wood shades, and will be instantly more dramatic with darker shades of décor to accompany it. Whatever style or colours you pair it with, grey stone flooring creates lends an abundance of personality and sophistication to your home. 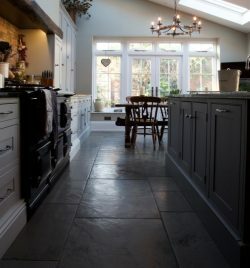 We have a few shades of grey limestone floor tiles that may just tickle your fancy. The Eiffel Grey Limestone is a pale beauty with a sophisticated twist, giving an airy and spacious feel to your living area. This lovely tile is light on colour but heavy on character with its gentle mottled grey tones that adds depth and personality, and is the perfect backdrop to the design decadence of either bold colour or toned down neutrals. The dark and moody shades of grey offered by our Huntingdon Limestone Seasoned brings a little drama into your living space but this tile shows its homely side with its smooth, worn finish. The striking shade adds character and beauty in both large and small rooms, without being too demanding on the eye. For a middling-dark shade of grey stone tile that lends a strong, sophisticated air, take a look at our Denham Limestone tile. 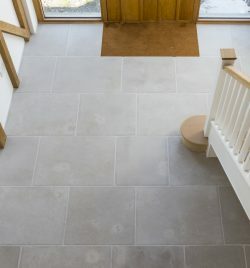 The cool grey of this limestone offers a time-worn aesthetic giving it the feel of belonging to a home with a heritage. This tough limestone tile with its textured surface and lovely looks is also frost resistant so it can be used inside and out. We have plenty of other shades of grey stone floor tiles for you to choose from. Take a look at our full range and be inspired!